Bamboo Hardwood Flooring is a hardwood flooring product that is pleasing to most people, and the production of this flooring is not harmful to the environment. People have been using Bamboo products, like tools, weapons, etc. for thousands of years. Bamboo has proven to be strong and useful to humans, and Bamboo flooring is no exemption. Bamboo flooring is more comfortable than you might think. Most people think round cane when someone mentions bamboo, but the fact is that bamboo flooring feels just like normal hardwood. 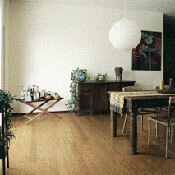 Bamboo flooring manufacturers have perfected the art of creating bamboo flooring. First every bamboo stalk is cut into strips, then most bamboo products are steamed for color variation, after that the purification process is started, then the bamboo is kiln dried to ensure accectable moisture content, then the milling of the bamboo, and finally the bamboo is heat pressed together with pressures up to 1,200 tons PSI. 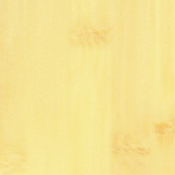 Bamboo is one of the very few hardwoods that can vary distinctly on the hardness scale. As a general rule consider the color of the bamboo flooring, usually the darker the color the softer the bamboo will be. 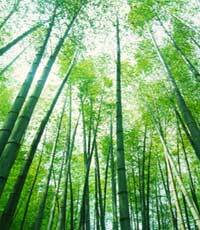 Carbonized bamboo will be the softest type of all bamboo products. Natural Bamboo is generally much, much harder and will wear better. Even though the color will make a difference in hardness, all bamboo products will last if properly cared for. 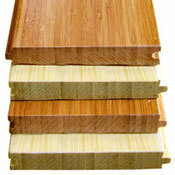 When making a Bamboo hardwood selection be sure to ask if the wood is mature enough. 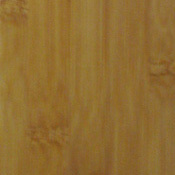 Most U.S. Bamboo complaints are caused by immature wood because immature wood is weaker and more prone to damage. Please remember to consider all of these important aspects when considering Bamboo flooring. These are some Bamboo Products we offer.